Perhaps you don’t realize it, but rides can also be protected by copyright. 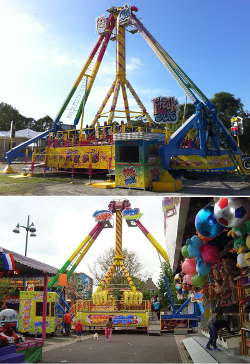 The Dutch manufacturer KMG develops, designs and manufactures amusement rides. In 2002 KMG designed “Freak Out” and filed a lawsuit against the Dauphin family. KMG believes that the defendants infringe KMG’s copyrights by exploiting an attraction which is practically a copy of the ‘Freak Out’. Elements of the object which only serve to a technical effect or are too much the result of a choice limited by technical principals are excluded from protection. KMG primarily bases her claims on the statement that her attraction ‘Freak Out’ is protected by copyrights and that KMG is the copyright owner. The fact that the object meets technical and functional demands does not affect the fact that the design margins or the options of choice can be such that there is sufficient room for creative choices of the maker, which can lead to an object being protected by copyright. A comparison of the total impressions of the objects of both parties indicates that both the design and the decoration of the elements which characterise the total impression of the ‘Freak Out’ seem to have been taken over in the ‘Hang Over’ one-on-one. The total impression of the attraction of KMG and the attraction of the defendants are therefore considerably equal. KMG picks no longer that foreign firms run off with their ideas and designs and CC Proof support this completely. This news proves once again how important it is to register your work, including fairground attractions.